This is gonna be one of those "good news, bad news" columns. The good news is that the stock market is now poised to challenge the record high it set back in September. There's a relationship between SJB's price and that of SPY. This is gonna be one of those "good news, bad news" columns. The good news is that the stock market is now poised to challenge the record high it set back in September. And the bad news? The bad news is that the stock market is poised to challenge its record high. Confused? Just look at the chart below. See the green rectangle? 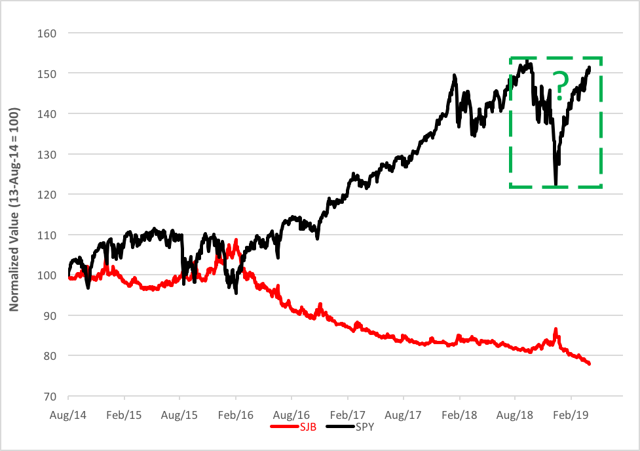 It projects a congestion area in the normalized price of the SPDR S&P 500 ETF (NYSEARCA:SPY) that would be formed once the fund regains its fall summit at the $293 level. IF the fund regains the summit. That's where the question mark comes in. If the market rises to test the old high then fails, that's bad. If, on the other hand, a new high is made, that's good. Very good. Good as in a further 20 percent run to the upside. There's a compelling case for a bullish breakthrough made by the chart's red line which tracks the normalized price of the ProShares Short High Yield ETF (NYSEARCA:SJB). SJB provides unlevered inverse (-1x) exposure to the Markit iBoxx $ Liquid Yield Index, a market-weighted index of corporate high-yield bonds with maturities between 3 and 15 years. Buying SJB is a bet against junk bonds. SJB rises when junk is, well, junk. SJB declines when low-grade debt fares well. There's a relationship between SJB's price and that of SPY. You might say that SJB is, in fact, a leading indicator of SPY's trajectory. Junk bonds and the common stocks tracked by SPY have low-priority claims on corporate earnings and liquidation proceeds. Junk bonds, though, are more exquisitely sensitive to wobbles on corporate balance sheets and income statements and are first movers. It makes sense that the junk market would be more reactive than stocks. That's why stock traders keep a keen eye on junk debt for "tells." A while back, SJB broke through a double bottom which set up its current decline to the $21 level. Another 5 percent decline in SJB's price puts a new bearish objective in play. And, by extrapolation, lends a more bullish glow to the stock market. So, if you're looking for a reason adjust your equity exposure, keep your eye on that squiggly red line.